Board decision for bank account opening is a resolution surpassed in a Board Meeting, certain persons in a company are authorized to open and control the Company or LLP Bank account. 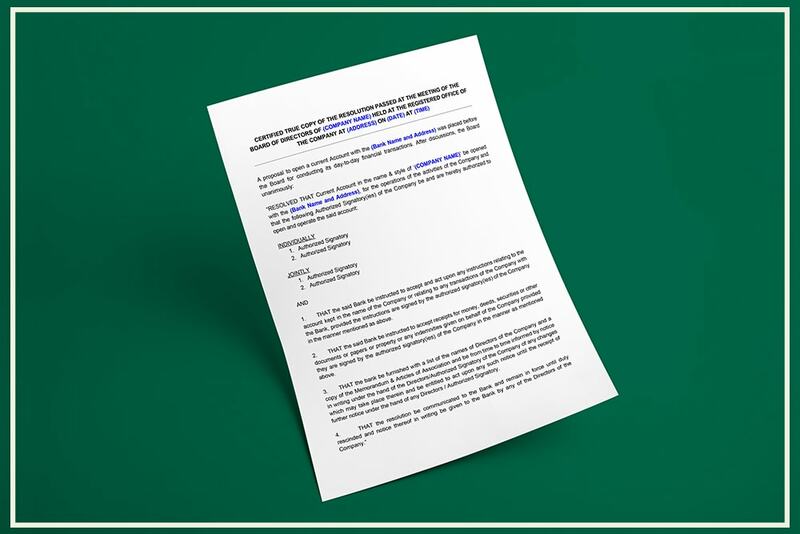 This document will specify who may sign the cheques, borrow money or make banking decisions. As a Company could be a separate legal entity, for opening bank account the board resolution and also other important documents are required for opening a bank account. If the Company desires to have or in need to have Bank accounts with different banks, then separate Board Resolutions needs to be executed for opening the bank account for every bank required. After the incorporation of company or LLP, the first and most important thing done is Board resolution for the opening of a bank account. A Private Limited Company, Limited Liability Partnership, Limited Company, Section 8 Company or One Person Company or Foreign Companies requires a board resolution for opening an account in the bank. Once, the board resolution for an opening bank account is formed, it needs to be printed on the business or company letterhead, signed by the Directors and submitted to the concerned Bank where the account is to be opened. The board resolution for an opening account in the bank must be printed on the letterhead of the organization. At a Board Meeting, two or more of the Directors of the Company with quorum should sign the board resolution. 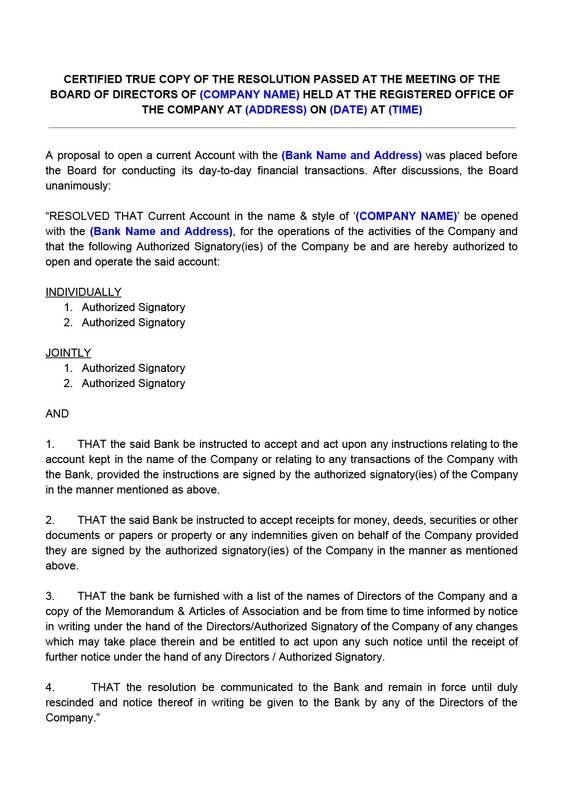 The Board Resolution for Opening of Account in the bank can be signed by the sole Director and shareholders if it is a One Person Company. In the Board meeting, Director or Officer or Employee (one or more) of the business can be voted by the Board of Directors for opening and controlling the account opened in the bank of the company. A photocopy of the board resolution can be kept as a record with the Company while the original is submitted to the Bank while opening the account for the Company.